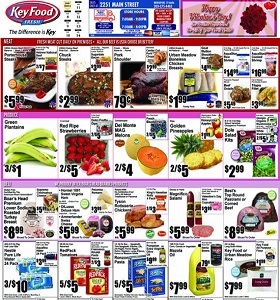 Key Food Weekly Flyer February 8 - February 14, 2019. Happy Valentine's Day! Key Food Weekly Flyer February 8 – February 14, 2019. Happy Valentine’s Day! -$7.99/lb Danish Blue Cheese; $6.99 Harvestland Chicken Breasts. To see the weekly circular for your favorite Key Food store, search by ZIP Code or city, state.